Per Marco's request, I have uploaded the wallpapers for Mercedes SL 300 Gullwing. If you are looking for any wallpapers which are not able to find on Dieselstation, please feel free to drop me a line and it will be my pleasure to get them for you. 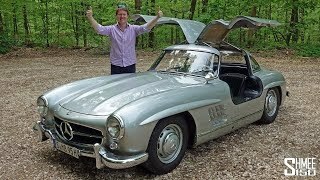 NEW YORK � Fifty years ago (February 6th � 14th, 1954) Mercedes-Benz held the international unveiling of its now-legendary 300SL Gullwing coupe at the New York Auto Show. An unusual event for an auto company that still unveils most new cars at European shows, the New York debut was proposed by entrepreneur and Mercedes-Benz distributor Max Hoffmann, who recognized the unique appeal of the 300SL in the U.S. market. At that time, the International Motor Sports Show was held in the New York Coliseum at Columbus Circle, where the brand-new Time Warner complex is now located. A 300SL racing sports car had caused a stir in the motorsports world as early as 1952, winning both the famed Le Mans 24-hour race and the Carrerra Panamericana endurance rally in its debut season. Then, to the surprise of many, the company entered the car into series production. After its debut in New York City, the SL started an enduring legacy of exciting sports cars from Mercedes-Benz. 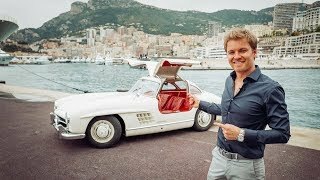 The 1954 debut of the 300SL coupe and a prototype of the 190SL roadster marked a flashy kickoff for the SL model line, which has played a key role ever since in making Mercedes-Benz the world�s premiere automotive company. 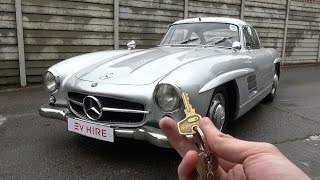 The first of five generations of Mercedes sports cars, the 300SL coupe is best known for its eye-catching gullwing doors, which open skyward like a bird�s wings. 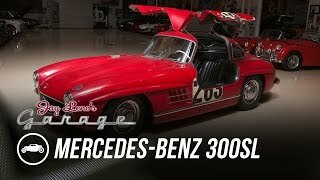 The 300SL featured then-innovative technology such as the world�s first four-stroke gasoline engine with direct mechanical fuel injection, as well as a race-bred tubular space frame and independent suspension. In March 1955 the final version of the 190SL � a small convertible that actually represents the spiritual genesis of the modern SLK line - was presented at the Geneva Motor Show. 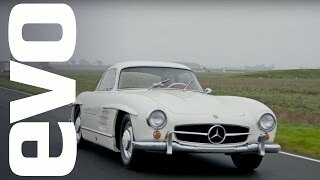 While the 190SL resembled its larger 300SL sibling, it was built with different chassis architecture, was less expensive and as such helped spread the word about Mercedes� fun-to-drive, high-quality sports cars. Two years later, Mercedes-Benz introduced a convertible version of the 300SL, which continued through 1963. Production of the 300SL roadster and Gullwing coupe totaled only 3,258 cars for the first-generation SL line, designated internally as the W198 series. By 1957, a total of 1,400 units were produced. Today, the 300SL is highly prized by car collectors, and in particular, the rare and charismatic 300 SL Gullwing commands sale prices well over $300,000. Mercedes-Benz launched the second-generation SL coupe/roadster in 1963 with a larger, more powerful version of its in-line six-cylinder, fuel-injected engine. The new 230SL was to replace two models of the former sales program at once, the 190SL and the 300SL. In 1971, an all-new SL began an astonishing 18-year reign as the highly coveted Mercedes-Benz �boulevard cruiser.� The SL of the 1970s and �80s (known internally as the R107) encompassed such memorable models as the 350, 380, 450 and 560SL. Production of the third-generation SL totaled a record 237,287 cars through 1989. With the launch of the fourth-generation SL in 1989, Mercedes-Benz locked up the SL�s claim as the world safest convertible by debuting an integral roll bar that popped up in 1/3 of a second if the car ever sensed an impending rollover. In this same spirit, the new SL came with unusual seats that integrated the shoulder anchor for the seat belts directly into a magnesium-frame seat back. The first SL with a fully automatic convertible top, the 1990-model 500SL also marked the debut of Mercedes� four-valve-per-cylinder, dual-overhead V8 powerplants with variable valve timing � engine architecture later featured in many Mercedes-Benz cars of the �90s. A six-cylinder 300SL was also available, and a formidable six-liter V12-powered 600 SL was added in 1993. About 200,000 SL sports cars carrying the R129 engineering designation were sold through 2002. The current SL500, which made its debut in 2002, is the first SL with a automatic retractable hardtop -- technology that transforms the car from a luxury hardtop coupe to a top-down convertible in 16 seconds at the push of a button. The 2003-model year SL500 was also the first-ever car with electronic braking, which works together with ESP stability control and ABC active suspension to provide unparalleled handling and safety. Since its launch, a SL55 AMG with a supercharged V8 and the V12-powered SL600 � both boasting nearly 500 horsepower � have been added to the current SL line. The latest edition the SL lineup is the new SL65 AMG powered by a 6.0-liter V12 engine producing 604 horsepower and 738 lb-ft of torque.